Love u more than anything...: Ohio day #7 - Playdate with friends!!! This morning Zac and I drove up to Dayton to visit some of my friends from High School... Katie and I were best friends in high school and have, of course, stayed in touch since then. She now lives in Gettysburgh and has an adorable little girl, Giada... who I have NEVER met before today!!! Angie is married to Katie's brother- and we also went to high school together but didn't really become close until after Angie and Greg got married and had Ethan. Angie now lives in Dayton- so it was the perfect meeting place for us today. Our 3 kids are all similar in age, so needless to say it was an interesting blend of fun, whining, "mine," "no," and overall cuteness galore. 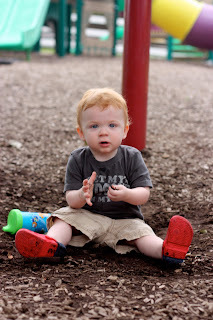 Lots of slides, swings, and other fun outdoor toys and what does Zac enjoy the most? The dirt. Enjoying some Grandma time... Zac doesn't care if it's not his own Grandma- he's just quite fond of the Grandma lap. I don't think I need to reiterate how much I love my life in California... it fits me really well. But ending a day like today makes me sad... sad that it won't be another year until I see Katie & Angie again. And even then it's not a definite. But I'm grateful for the time I did have with my wonderful friends... and so very grateful for modern technology that allows us to stay caught up with each other so easily.